This white 2" x 55 yd roll of Savage Gaffer Tape is a staple of any movie set or studio, and although called an "expendable", it's an absolute essential. Among its many uses is safely taping down cable on the floor, securing seamless paper rolls, and creating foam core constructions or any kind of temporary mounting in graphic arts. 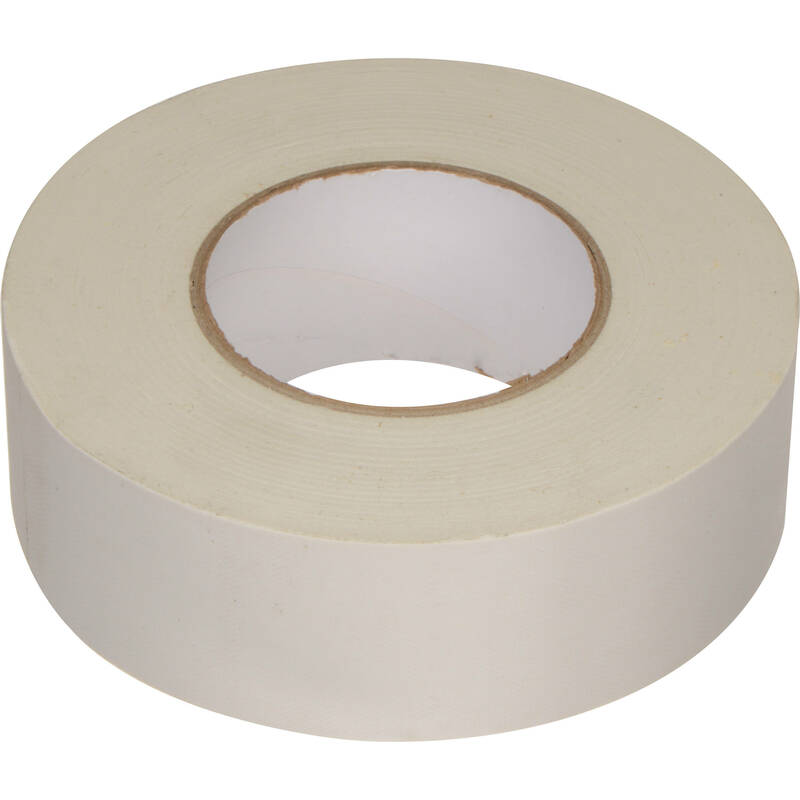 Box Dimensions (LxWxH) 6.1 x 6.1 x 2.1"
Gaffer Tape (White, 2" x 55 yd) is rated 4.0 out of 5 by 13. Rated 2 out of 5 by Bill from Sticky this is First time I bought this brand which I won't purchase again. The sides of this roll are sticky which is great if working on a smooth slanted surface since it won't slide away when you lay it down but annoying when it sticks to the table top, a piece of paper or anything it comes in contact with. Rated 5 out of 5 by Wilky from Its tape Its tape, its green, it sticks to things. Rated 4 out of 5 by Bill from Good, within limits I bought this Chroma Green tape because it was made by Savage, the same people that made the paper I was trying to match. I also bought it because I only needed a little bit and it was the least expensive. The color match was very good. But I was wrapping the tape around a cylindrical shape (the leg of a plastic manikin.) The curve presented a problem when keying. It seemed to reflect light differently at various points along the curve. Maybe we could have built a white, circular reflector all around but that was way too much trouble for the simple shoot. In the end, we did not use the tape but used the actual paper, cut into strips. I think the tape was more reflective than the paper, so that seemed to be the problem. Perhaps the more expensive, cloth backed tape would have been better. I don't know. I would not rule this product out, it will probably be fine on flat surfaces where you can control the reflections easier. Rated 3 out of 5 by Michael from Not sure if this is Chroma Green The picture looks like Chroma Green, but when it turned up, it just said green and was quite a bit lighter than I expected. It could be my fault. Maybe I don't know what chroma green looks like. I know it doesn't even come close to matching my Chroma Key Green Backdrops. The adhesive is not as good as 3M tape. Rated 5 out of 5 by Terry from Truly a close match to Chroma Key Green Weve tried other manufactures so called Chroma Key green gaffer tape and werent happy with he color match (were more of a Ultimatte Green shade) so thought wed give this one a try. This Savage tape truly comes close to matching our CK Green seamless paper & stage curtain. So for that reason I give this 5 stars. Rated 5 out of 5 by Tony from Best Value Searched for the best tape for the money, as in cheapest $ per inch. Savage came up best. I've used Savage paper backdrops for years and loved them! Tried the tape, works great! Good deal. Rated 5 out of 5 by Nezzy from Awesome! Do a lot of green screen shooting, always had issues in seeing tape, not with this!! !